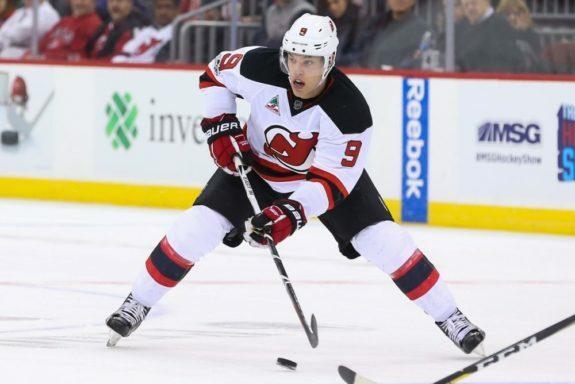 In his first season with the New Jersey Devils Taylor Hall was expected to be a savior for a franchise that had missed the playoffs for four straight seasons, as he easily became their most explosive weapon since the departures in consecutive summers of Ilya Kovalchuk and Zach Parise. But he couldn’t do it all himself, and more often than not the team struggled to find more offense than they did a season prior. Still, Hall finished with 20 goals/53 points in his first 72 games with his new squad and was easily the team’s most consistent scoring threat. Now in a new season, with an infusion of youth and speed throughout New Jersey’s lineup Hall is not only racking up points but he’s also elevating the play of his teammates – and vice versa. 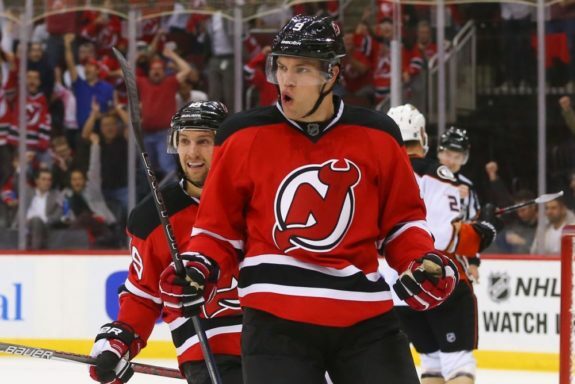 Through an eighth of the season, the Devils are off to their best start since 1993-94 at 8-2-0 and their superstar left winger has a shot on goal in every game (31 total) and 13 points (3g-10a). The coaching staff has experimented with a few combinations with Hall on the top line, and over the past five games alongside Nico Hischier and Drew Stafford he has amassed nine points (2g-7a) — including a superb four-assist game in Ottawa on October 19. His precision passing on the power play most recently with rookie Jesper Bratt has been impressive, even if it wasn’t for a Devils power play that has been mostly pedestrian the past few seasons. The duo each had three points in New Jersey’s most-recent win – a wild, back and forth contest with the scrappy Arizona Coyotes. Despite the Devils hot start, there is still much to work on, and sometimes more can be learned from victory than defeat. The night before the win over Arizona they fell behind 2-0 to the Ottawa Senators before rallying for four consecutive goals, only to surrender two goals late with the Senators having their goalie pulled. New Jersey then rallied back in the shootout with two straight tallies with their proverbial backs to the wall. Most of us think of Taylor Hall as a dynamic goal scorer, but one aspect of his game that is underrated by many is his passing ability. Of everyone on the Devils, his passes are always the crispest, the most on-point, and most often tape-to-tape; over his 463-game NHL career Hall has 84 more assists (239) than goals (155). The Devils depth is one of their biggest assets this season with 15 different players having scored a goal already, 20 of 21 skaters with at least one point, and three players averaging a point per game through the first ten games: Hall (13), Will Butcher (11), Bratt (10).